Remember: The most significant factor to successful cutting is a sharp knife! Different products will require different knife blade thicknesses & shapes. In the case of Kevlar® reinforced tube & hose special blades may be required. 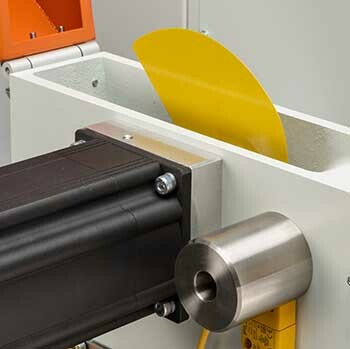 As a general rule: the thinnest knife blade possible should be selected when cutting flexible materials such as flexible PVC, PU & certain rubbers. The more rigid the product, the greater the thickness of blade required. The blade shape also plays an important role. The choice is between a "chop" blade or a "slice" blade. We generally recommend a thin, straight "chop" blade for smaller flexible extrusions & a curved "slice" blade for larger flexible, semi-rigid & rigid materials. We have around twenty types of custom curved slicing blades in stock, as well as straight "chop" blades. We can provide an immediate response to your requirements. Our knife blades are available in a variety of materials, such as stainess spring steel, razor blade stainless steel, normal spring steel, tool steel & high-speed steel. Stainless steel must be used for medical & food applications. It is also recommended when using the blade lubrication system. Due to the high impact method of cutting used by the Servo-Torq® rotary cutter, very hard grades of steel, or ceramics, are not recommended. These materials tend to shatter on impact and, as such, are not good solutions. Many of our spring steel curved blades can be re-sharpened & re-honed using low cost grinding methods. In this way, one blade can have a lifespan of many millions of cuts. > Extrusion cutter blade design datasheet. > Cutting Hints (PDF file).